Ok..I know..I am too late on this one. But better late than never. Makar Sankranti is celebrated during the Hindu month of Magh. This is in the month of January. It is one of my favourite festivals, as it is only during this Hindu festival that wearing Black is considered auspicious. Cool na! I am not too sure, but of what I know, black is worn on this day because black sesame is considered auspious. Another reasoning behind it can be that Sankranti comes at the peak of the winter season and black colour retains and absorbs heat, helping keep warm. The day prior to Makar Sankranti is called Bhogi. On this day people clean their house and indulge in domestic activities with their family members. same) it is believed that this ritual is supposed to keep you away from diseases and ailments through out the year. In other words, a person who does not do this, will be a Rogi (diseased one) during that year. pinch of salt. Now Food! How can Indian Festivals even be complete without the mention of food? Anyways coming back to Makar Sankranti, this is how I do the puja. This may not necessarily be the correct way, but this is how my mom does it and now I follow suit. the puja is also referred as the Sugad puja. On these pots, 5 vertical lines are drawn with your fingers dipped in haldi (turmeric) and kumkum (vermilion) one after the other, overlapping on each other. The black (larger) pot, is placed on the dais you wish to perform the puja on and filled with 5 different types of nuts. I usually use dry fruits, as it is easily available. But traditionally people use Harbhara, Moong, Pieces of sugarcane, etc. ; basically fresh produce from the farms, since it is a harvest festival. 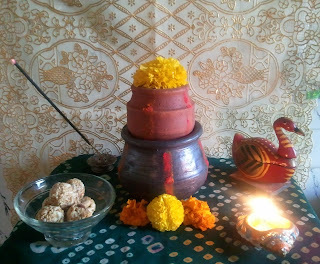 This is how my Sugad Puja Looked. I chant the Ganesh Aarti first, followed by the Durga Aarti and finish the puja with a small prayer. After that I seek blessings from elders, offer them til gul ladoos wishing them..
Wiki Says: Tilgul is a colourful sesame candy coated with sesame seeds. Til Gul Kha aani God God bola= Eat Tilgul and talk sweet. The under-lying thought in the exchange of Tilguls is to forget the past ill-feelings and hostilities and resolve to speak sweetly and remain friends. 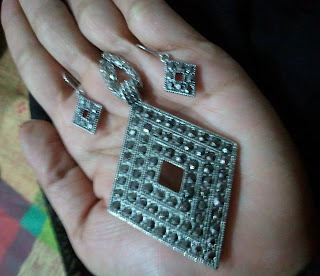 For the pooja I had worn a black saree and this is how I had accesorised. 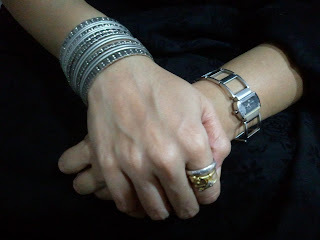 Bangles: Local Store in Mumbai bought ages ago. Watch: D'signer. Gift From Sister. Lovely post Aditi. So informative. Only thing I tell people about sankrant is that you have loads of til ka laddu on this day. :) u r a sweetheart. thnx. These are some interesting facts,I didn't know that much myself ! Love ur bangles and the whole puja set up ! As they say in Marathi, til gul kha, god god bola. Thanks Shubhi. Wish u the same. Lovely accessories! How I miss the home made sweets or pithas of Makar Sankranti! My grandma used to make those delicious stuff! Thaks a bunch for stopping by and commenting dear! Started followig you now on GFC (Juneli#3)! Love u Ayantika..n love ur blog. Thanks so much Oeendree. Feels great to be a part of the blogging world. Beautiful ppl like u inspire me n i hope to live up to the bar u guys have already raised. Waiting 4 ur next post. Thanks Shreeja. Yes..i do get a lot of gifts. Hey thanks i needed the puja thing and i was not able contact anything.